Billboard spoke with Christopher Abbott and Kid Cudi at Billboard Winterfest during Sundance 2015 about their new film James White. Along with talking to Cudi about the challenges of the role he played in the movie, the interviewer managed to squeeze in a question at the end about Man On The Moon: III. The rapper turned actor revealed that he is actually planning to release another new album before he releases MOTM: III on this year. "I'm always making music. The beauty in that is that I have a lot of material. And I'm actually thinking that it would be good to release something in the meantime, before Man On The Moon: III comes out. Another Kid Cudi album, it's just kind of along the lines of what I did with Indicud or Satellite Flight which it's just it's own standalone thing but still a Kid Cudi album. The Man On The Moon: III album is something that's gonna take some time but I know the fans are gonna be patient and I really appreciate that guys, thank you for your patience. But Man On The Moon: III is coming, there may be an album before that just to tide you over." Billboard spoke with Christopher Abbott and Kid Cudi at Billboard Winterfest during Sundance 2015 about their new film James White. 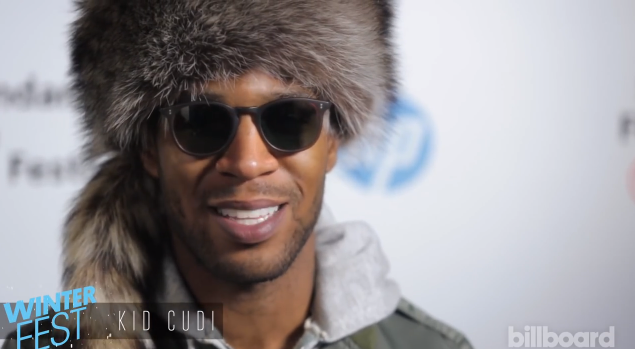 Along with talking to Cudi about the challenges of the role he played in the movie, the interviewer managed to squeeze in a question at the end about Man On The Moon: III. The rapper turned actor revealed that he is actually planning to release another new album before he releases MOTM: III on this year. "I'm always making music. The beauty in that is that I have a lot of material. And I'm actually thinking that it would be good to release something in the meantime, before Man On The Moon: III comes out. Another Kid Cudi album, it's just kind of along the lines of what I did with Indicud or Satellite Flight which it's just it's own standalone thing but still a Kid Cudi album. The Man On The Moon: III album is something that's gonna take some time but I know the fans are gonna be patient and I really appreciate that guys, thank you for your patience. But Man On The Moon: III is coming, there may be an album before that just to tide you over."